The girls arrived at my house in the evening so we could all car pool in my Yeti (12 passenger dream). Can I just say how wonderful it is to not have to pack my car full of groceries or bags of crafts for activities and not have to plan out an entire event. Yes, the event costed a little more than we would normally spend per girl but to not have to meal/activity plan and have someone else in charge was heaven!!! Did we leave an hour and a half early because we thought Friday rush hour traffic would be horrible? Did it end up only taking us 40 minutes because there was no traffic? Hey, it's better to be early than miss an activity. Am I right? Luckily we made some swaps made a head of time and the girls got to exchange some of them prior to the event. Cut a pink pipe cleaner in half and curl up one of the ends. Fold back the opposite end to create the face. Hot glue the black bead (beak) and googly eyes. Take a 2 inch piece of black pipe cleaner and fold in half. Take one end and slide it in between the pink flamingo and twist to secure. You can also add a dab of hot glue. Slip a safety pin in and there you have a flamingo swap!! The event started with a fun warm up game followed by a rotation of zoo activities. We got to feel real animal skins and learn about conservation and illegal poaching. 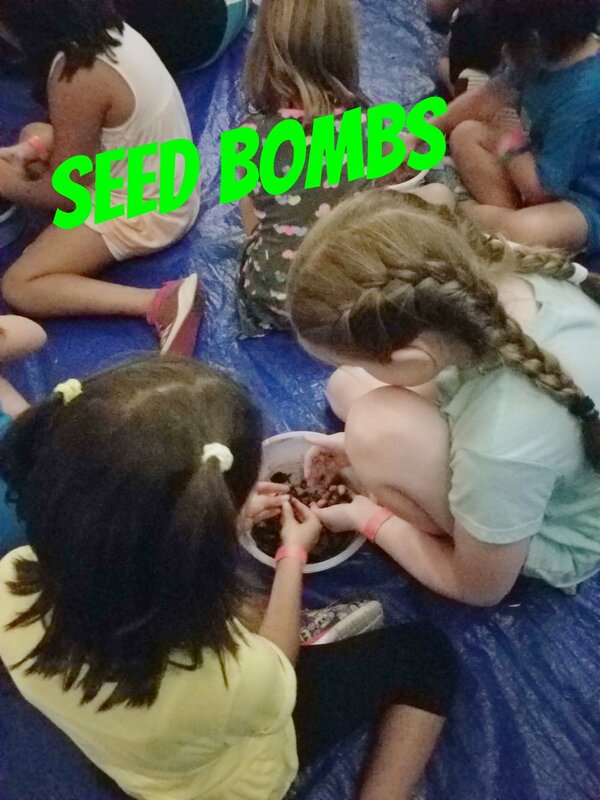 We made seed bombs with dirt, clay, and seeds. We learned about animal enrichment and how the zoo provides them to the animals. The girls decorated a pinata as an enrichment tool. Once dry they fill the pinatas with snacks for the animals and hang them in their cages. They do this with big and small animals like lemurs. We would later get to give our pinata to the Amur Leopards! After the rotation of activities and ice cream social we embarked on a zoo night hike. It had just stormed so it was a little wet and muggy(humid) outside. I wish I had a night camera to capture some amazing moments. We hiked pasted the lion enclosure and looked into the window looking into the cave. There was a lioness in the back that was rolling over. The girls thought that was so cool. Because it was so dark, not all the girls got to witness the second lion. He was up against the window. When I peered into the glass I could make out the shape of the lion’s head with a large mane. I looked closer and saw that his eyes were open and he was staring back into mine. With only glass between us, we were head to head. In that moment my heart jumped a little. The head was so big!!! What a cool experience! The following morning, after a delightful hot breakfast, we went out on another hike to finish off the parts of the zoo we didn’t get to on the night hike. Of course it poured on us and not being prepared made it even more memorable! We ended by the Amur Leopards where we fought through the rain to catch a glimpse of the leopards when the zoo keeper tossed in our pinata. Because of the rain the leopards seem uninterested until the zoo keepers decided to toss in real meat. We had lots of fun and the girls honestly didn’t mind the rain. I think they enjoyed it actually! This trip was just another example of how fundraising can help girls accomplish goals and do some incredible things! I hope they carry the memories from this trip with them throughout their lives and share the stories with their own children. What trips has your GS troop taken?